To mimic gore, they used makeup and pig's blood. They shot bullet holes in one of his sweatshirts. And to top off Arkady Babchenko's staged murder, they even took him to the morgue. The journalist revealed Thursday how Ukrainian security services faked his murder to thwart a contract hit allegedly arranged by Babchenko's native Russia. 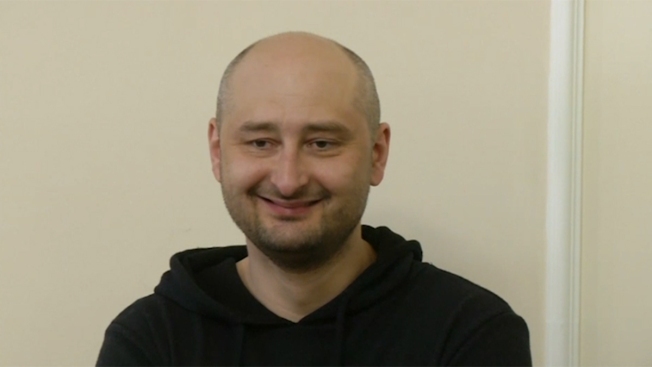 Police said Tuesday night that Babchenko had been shot and killed in his apartment building. The next day, he showed up alive in front of journalists and authorities revealed that it all had been a ruse and said that the organizer of the planned assassination had been arrested. At a news conference, Babchenko himself wasn't clear on why the security services thought the elaborate deception was necessary. "They probably had their reasons. Maybe they wanted to collect proof that would be 100 percent solid," he told reporters. One of Russia's best-known war reporters and a vehement Kremlin critic, the 41-year-old Babchenko fled the country in February 2017 because of what he described as death threats. He said Ukrainian agents came to him about a month ago and said that Russian security services had put out an order for his slaying. "I said: 'Great. Why have you been waiting for a month?'" he recounted. To make the staged murder look genuine, Babchenko said, security officers took his sweatshirt and shot holes in it. Babchenko said he put on the shirt and got smeared with pig's blood. "I took a mouthful of it and spit it out," he said. One of the officers also told him how to fall down to appear to have been genuinely shot. His wife called an ambulance and he was taken to a hospital intensive care unit, where a forensic expert "documented" his death. After that, he ended up in a morgue that he said was "freezing as hell." Once inside the morgue, Babchenko said he was "resurrected," taking off the blood-stained clothes. "I just sat there watching the news about what a great guy I was," he added. Babchenko said Thursday he had told his "closest relatives" about the sting operation in advance, although on Wednesday, he said he had apologized to his wife "for the hell she had to go through in the past two days." The Russian Foreign Ministry denounced the Ukrainian government, saying it was "fanning anti-Russian hysteria." Relations between the two countries have been strained since 2014, when Russia annexed Crimea and separatists backed by Moscow in eastern Ukraine have fought government troops in a conflict that has killed more than 10,000 people. Babchenko's faked death caused real shock in Ukraine, where other journalists have been killed in recent years. It also brought widespread criticism from press freedom groups. Sergei Tomilenko, head of the Ukrainian Journalists Union, complained that authorities had presented no evidence that an assassination plot actually existed or that Russia was involved. Without such evidence, he said, the deception could be considered politically motivated, "which discredits not only journalists, but the image of Ukraine." Added Pauline Ades-Mevel of the group Reporters Without Borders: "We condemn the use of these means to protect journalists." But Interior Minister Arsen Avakov lashed out at the criticism. "What would you want? That Babchenko had been killed?" he said. Babchenko said he is staying in a secure location for the time being and his immediate plans are to try to overcome the stress he's endured. "I'm planning to have a good sleep, get drunk and fall asleep while drunk and think about nothing for the next two or three days," he said. On Wednesday, when Babchenko's stunning appearance in front of journalists brought whoops and applause, Ukrainian Security Service chief Vasyl Gritsak said a Ukrainian citizen who allegedly was paid $40,000 by the Russian security service to organize and carry out the hit had been arrested. The man in turn allegedly hired an acquaintance to be the gunman. The alleged organizer, Boris German, was arraigned Thursday night. Prosecutor-General Yuriy Lutsenko said the man contacted by German to kill Babchenko informed authorities of the plot. At a subsequent meeting of German and the proposed triggerman, German said he had received orders for about 30 other killings, including that of a former officer of Russia's Federal Security Service, Lutsenko said on Ukraine's Inter TV channel. News reports said German's lawyer has identified him as the executive director of a joint venture in Ukraine with German arms-maker Schmeisser.